The EIPR links two 10/100 Mbps Internet Protocol (IPv4) networks-passing appropriate traffic while blocking all other traffic. One network is the local-area-network (LAN); the other is the wide-area-network (WAN). The built-in stateful firewall passes communication initiated on the LAN-side while blocking WAN-side initiated communication. With Port Address Translation (PAT), LAN-side clients can access the Internet. Network Address Translation (NAT) allows a one-to-one translation between LAN-side and WAN-side devices. With Port Forwarding, LAN-side devices can be accessed from the Internet. 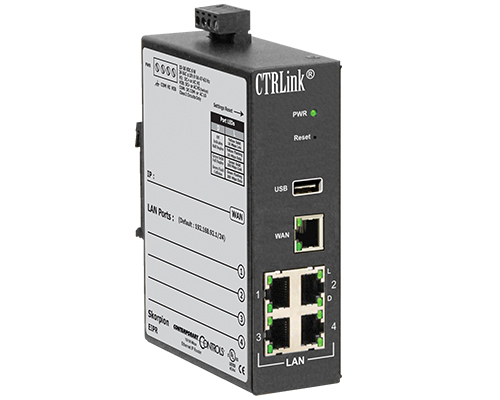 The EIPR incorporates a four-port Ethernet switch for multiple LAN-side connections. An external Ethernet-based modem - cable or DSL - can be used to connect to the Internet. DSL modems connect via the PPPoE protocol. A USB port allows expansion to wireless networks. If a suitable USB adapter is attached, either EIPR model can become a Wi-Fi access point. The EIPR-V can also access cellular networks through its USB port if a suitable cellular adapter is attached (in which case its wired WAN port is disabled). With its real-time clock and OpenVPN firmware, the EIPR-V also supports a VPN (virtual-private-network) - so you can obtain secure remote communication - compatible with cloud-VPN service from Contemporary Controls. Visit our RemoteVPN product page for more information about secure remote communication over the internet.